Paul Richardson, a native-born American, took on publishing a magazine about the Russian life while sitting amid the woods of Vermont. He talked about his endeavour to Rossiyskaya Gazeta. During the Soviet era, subscriptions to the America magazine – which was specifically published for the Soviet Union – could only be achieved by special privilege. The superbly-illustrated monthly magazine Soviet Life was published in response to the ideological enemy. Eventually, for obvious reasons, neither the magazine, nor Soviet life itself existed any longer. However, the magazine did not disappear, as many others that were even more well-established did at the time. Paul Richardson, a native-born American, took on handling the publication of Russian Life magazine himself. Rossiyskaya Gazeta (RG): So Paul, how did it all happen, and how come you ended up issuing a very detailed and highly objective publication about Russia while sitting amid the woodsof Vermont? Paul Richardson: You know, the fact is that average Americans don't take great interest in what goes on beyond their own coasts. Publishing stuff about the rest of the world has been, and will always be a tough job in the United States. But it still somehow gets published, and the topic of Russia found a place in my heart. I was taught Russian while I was in graduate school at the University of Indiana. After that, I studied and lived in Russia, trying to get my head around that enormous country – and I wanted to share my enthusiasm for it with people in the United States. I hoped to raise the level of discussion about Russia above simple “yes” and “no” topics, which are the only ones that show up in U.S. media. 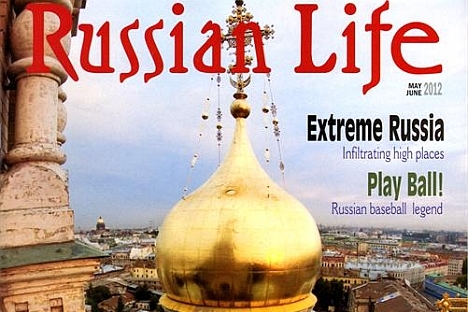 Then, in 1995, the chance to acquire the Russian Life publication appeared. Sure, we produce the magazine in peaceful and leafy Vermont – one of the most beautiful and non-New-York-City locations you could imagine in the U.S.
RG:So you are both the editor and proprietor of the magazine? P.R. : I'd sooner call myself a joint owner. RG:Why knock yourself out? All of this hard work, presumably, can’t be brining you the huge dividends that are cherished by people in both our countries. P.R. : For sure, it's not the kind of business you go into to make big bucks. But it gives me a kick to break down the traditional walls that divide countries. And there are few others who also think it's worthwhile. Maybe I could have gone into teaching, as a professor of political science, but I decided to take a different route. RG: Do you have many people working at the magazine's offices? P.R. : Are you kidding? None of us are even on full-time salaries. We have staffers who help with translation and photo selection. We bring out a 64-page magazine six times a year. Over the past 12 years we've built up experience, and a group of regular contributors. At the start of the year, I ask all our writers to produce material in areas where they're acknowledged experts. We sort out the deadlines, and everyone usually meets them. RG: Has Russophobia ever hit you personally, as a publisher? P.R. : No, never – not even once in my life. People here don't think that way. Of course, I don’t carry a Russian flag when I’m running down the street either. RG: America is on the eve of Election Day. It seems like a serious battle between Romney and Obama. What happens if Mitt prevails over Barack? Will that damage everything connected to Russia? P.R. : I don't figure so – no single individual can alter U.S. foreign policy so radically. The things candidates say at campaign rallies is a completely different ballgame, compared to what take places in real life. Policy is made by the State Department in Washington. That policy hasn't changed much over the years, despite the claims that were made. RG:So what about the “reset”? P.R. : That's just a continuation of the same line, albeit with a few positive alterations. It's way better than things were, for example, under George Bush. And, frankly, I doubt that Romney can win. I'd prefer it – and this is my own view, not the magazine's – if Obama stayed in power. He has preferable policies. The math isn't on Romney's side. RG: In other words, the stats don’t predict success for the billionaire? P.R. : The stats pan out better for Obama. You have to bear in mind that what counts isn't victory in the total number of votes cast nationwide, but the votes state-by-state. At present everything points towards the incumbent president being re-elected. Of course things could change, but Obama has better chances of winning than Romney. What I mean here is that is not as important what the overall percentage of votes cast is, but the number of states where each person wins. Is that difference clear? RG:Sure.What do you think about Paul Ryan, whom Mitt Romney would like to see as vice president? P.R. : He's a conservative. The kind that won't benefit the United States. His Reagonomics with Romney won't deliver. RG: Maybe, but Obama's economic policies have hardly been a success. P.R. : What's the right way to put this? At the time he entered the White House, America was losing 800,000 jobs every month. The country was going down the drain. Unemployment got worse and worse. Obama turned into a doctor stemming the flow of blood from a patient. Maybe he hasn't found the cure yet, but he's done everything possible, and got the patient back on its feet. He stopped the U.S. from falling into deep economic depression. Rehabilitation is going to take time. Under the current administration we've been able to create new jobs for 30 successive months in a row. Right now it's in the order of 200,000 jobs every month. Before, we were losing 800,000 jobs a month. Maybe not everyone has the patience for it, but we're definitely on the right track. RG: If we can mention foreign policy – does Obama view Russia as some kind of enemy? P.R. : Not at all, Obama's a realist and a pragmatist. Every country has its own interests, and the president realizes that we all have to live and work alongside each other. Dialogue is essential. We're coming into the final couple of weeks of decisive fighting. There'll be new presidential debates on television. Let's see how it all pans out on the 6th of November.